Getting home after a summer eating in New York has been a shock to my system. Months of gobbling up almost every tasty morsel in sight had to come to an end some time, I suppose. Most of the time, I'd be conscious and eat well, but I just couldn't resist a goat's milk ice cream here and a lobster roll BLT there. Can you blame me? Walking through the door of my house greeted by both my dog and the wonders of central air conditioning, I knew my days of over-indulgence were over (well, at least for the time being). My lovely, well-equipped kitchen was a sight for sore eyes after a summer of rolling out cookie dough with a water bottle and hand-creaming butter. While the fridge is well-stocked with kale and cilantro and lentils and the cabinets overflowing with all kinds of grains and dried fruit, there is a dearth of fun food- though everything my mom makes is actually really delicious. It's been nice detoxing. I'm starting to feel like a real human again. But, for all of the great bits about being healthy, I still get that little itch, usually right after dinner. Sometimes a peach will hit the spot. Other times, a cup of chai tea does the trick. And as for those other times? Well sometimes my sweet tooth is far too insatiable a beast to be tamed by fruit and tea. Because I'm trying to let my body recover, I'm doing my best to avoid the two tubs of gelato currently residing in my freezer. 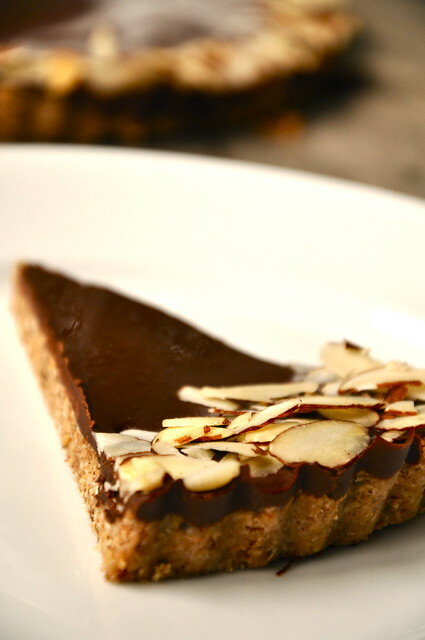 Instead, I'll opt for a slice of this chocolate almond tart. It's by no means dietetic, but it doesn't leave you feeling sluggish and have you jonesing for a snickers thirty minutes later. After all, I'll be free to stuff my face in two weeks once I get to London. In a food processor, pulse oats and salt into a fine meal. 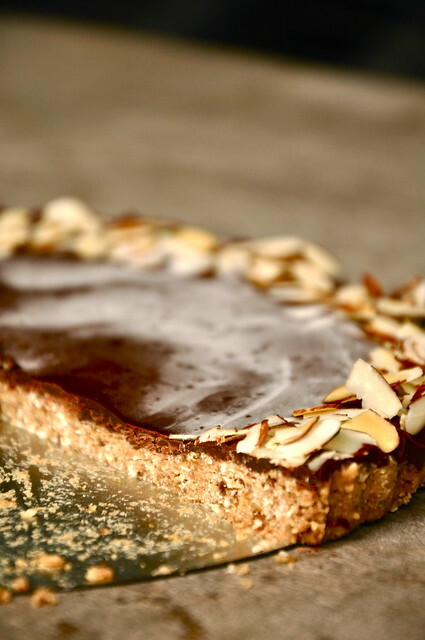 Add dates and almond butter and pulse until combined. Add almond milk, maple syrup, and vanilla extract and pulse until dough comes together into a ball. 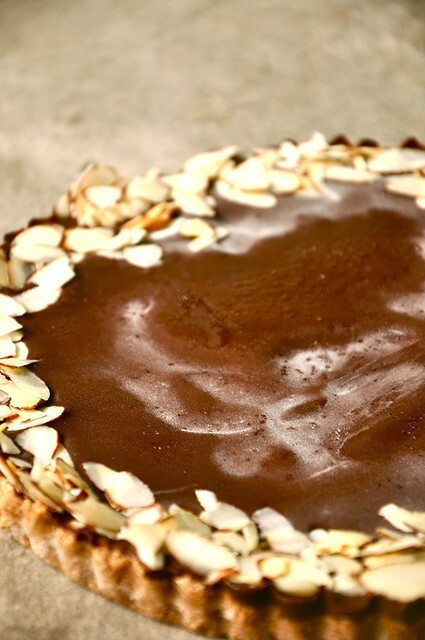 Press dough into a 9-inch tart tin. Meanwhile, set chocolate and coconut oil in a heat-proof bowl set over simmering water until melted. Pour chocolate mixture over dough. 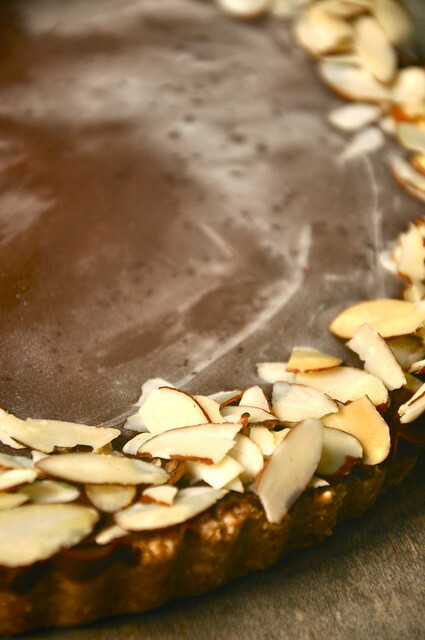 Sprinkle almond flakes and sea salt over chocolate. 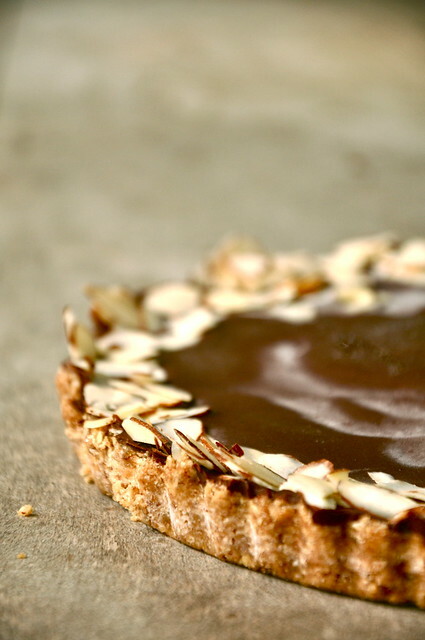 Cover tart and freeze until ready to serve.